I jumped at the chance to read a novel about a dragon, a creature of unimaginable power, unending intelligence, and strength. Tesser has awoken from ten thousand years of slumber beneath the city of Boston. What he sees is not primordial forests filled with faeries, witches, and vampires, but humans who have erected cities of stone and steel. Humans who have forgotten what magic is. 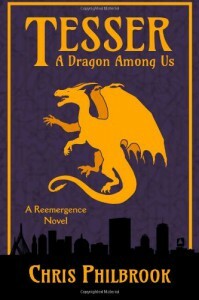 The story of Tesser's reemergence was enjoyable to read, though slow to get going in the beginning. I was disappointed that Tesser was in human form for the first half of the novel. I was hoping for a lot more dragon action, which I suppose the last half makes up for. More than once, I was annoyed by the crude language. I am not easily offended, but the phrase, "get your d! @# wet tonight" sounded like something you'd hear in a college frat house, not in what should be a creative tale about intelligent, majestic dragons. With numerous typos and misspellings, it was sometimes difficult to stay with the story. Typos like "taking" instead of "talking," "up" when it should have been "cup," "handling" someone a glass when "handing" a glass would have made more sense. But there were incorrect word usages like "it's" when "its" was the correct word, and there was even a sentence that abruptly ended. He was "younger in an indescribable." An indescribable what? I can only hope Chris Philbrook finds a good editor before he publishes again. I don't want to be too harsh because the basis of the novel is a good one, with magic and dragons, but one I felt needed to be more polished.